Take Sticker Shop in Taiwan for example. ▼ Left: LINE account without registration of phone number. Right: LINE account with registration of phone number. Free stickers without any requirement only appear on “New”. 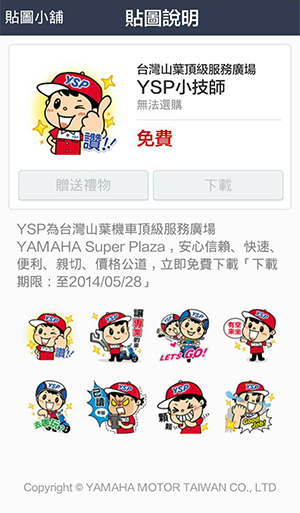 ▼ Without registration of phone number on LINE, even though you click on URL of stickers, you can’t own stickers still. Take Sticker Shop in US for example. ▼ Left: LINE account without registration of phone number and has connected to US server. Right: LINE account with registration of American phone no. and without VPN. *LINE will detect the region of your phone no.. And then, stickers of that region will show on Shop. If you don’t register phone no., LINE will detect the region of your network. In other words, if you use local number of another country, stickers in that country are all available for you. However, the problem is that few people have phone numbers of India, Japan, Korea, Thailand or Indonesia. *Free stickers requiring adding as friend and installing APP are still available. If you want to view these stickers, just connect your mobile to overseas server. Previous Previous post: 【2014/08/21】Free LINE stickers of Rilakkuma, Gudetama and KOBITOS! Next Next post: 【LINE stickers】Free Thomas stickers and use them forever!